We love to converse with people whose minds are wide open and who take great pleasure in thinking beyond conventions and norms. Danish-born and London-based designer Martine Jarlgaard is one whom we would call such a visionary mind. A firm advocate of sustainable and ethical practices in the fashion industry, Martine is fascinated by the role that technology can play in helping to solve some of the industry’s biggest challenges. In September 2016, she debuted the world’s first mixed reality fashion show at London Fashion Week, disrupting the traditional concept of a fashion show. And only 8 months later, she presented the world’s first blockchain-powered supply chain transparency fashion pilot at Copenhagen Fashion Summit in collaboration with Provenance, A Transparent Company, and FIA. Martine launched her eponymous luxury label, Martine Jarlgaard London, after having worked with Vivienne Westwood and All Saints in London and as Head of Diesel Female Apparel in Italy. Her designs are of a timeless elegance, her silhouettes and cuts are unusual in a subtle and sophisticated way. Garments that can stand the test of time. Below, I talk with Martine about blockchain technology for supply chain transparency and about how she imagines the future of Mixed Reality for fashion shows and the relationship between brands and consumers. Martine, what inspired you to start up your own fashion brand based on sustainable principles? Shaping a brand and a voice brave enough to step away from fashion as we know it, and to fundamentally change the way we define value, consume, communicate and interact. What do you consider as key influences for your own design process? I’m somewhat marked by my Scandinavian origin, and there’s definitely a sense of simplicity, melancholy, closeness to nature and Nordic noir which I identify with. An honesty towards all aspects of life in all its beauty, strangeness and brutality. I also have a weakness for the storytelling of Astrid Lindgren and Karen Blixen. What are the materials that you have you chosen for your current collection and where do you source them? For the Martine Jarlgaard London pre-SS18 ‘Fragile; a State of Emergency’ the fabrics consist of up-cycled high-vis workwear with reflective stripes, organic British alpaca, Italian surplus production materials, hemp, linen, and lace. I love contradictions and stories in materials and silhouettes. I mainly source fabrics from Italy and France, where I work with some of my favourite mills, which have been built on generations of refinement and outstanding quality. 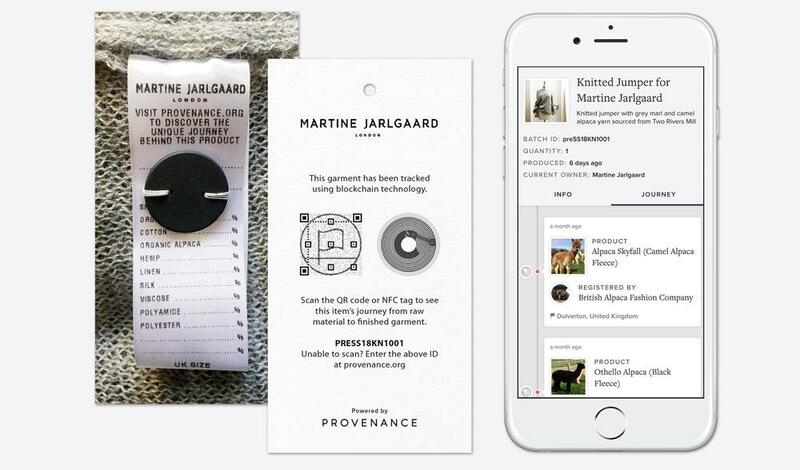 In spring 2017, you have partnered with Provenance, a tech company that uses blockchain technology for supply chain transparency, and presented the first fully traceable garment at the Copenhagen Fashion Summit in May 2017. Could you explain to me how blockchain technology works and how it enables a transparent insight into a supply chain? The blockchain is a decentralised ledger, which enables verification of authenticity, be that of cryptocurrencies, investments, supply chains or something entirely different. It consists of a network of independent computers verifying data and isn’t controlled by one person, company or institution. This in itself is highly relevant to the world we live in as it has the potential to change power dynamics, as well as it will, unquestionably, change the way we do business. When applying blockchain onto supply chains, this happens by logging the different supply chain stages in real-time. Once logged onto the blockchain the data cannot be changed or modified in any way. Pioneering supply chain transparency in partnership with blockchain technology company PROVENANCE. This knitted jumper is the first fully traceable garment. Why do you regard this technology as a groundbreaking innovation for the fashion industry? Consumers gain access to this data via QR codes and NFC tags in the garments, hereby empowering consumers to make well-informed choices when purchasing, by having access to information such as the where, when and by whom e.g. where the yarn was spun, the fabric woven or the garment cut and sewn. You have embraced working with technology and have used interactive and Mixed Reality for the presentation of your collections. What fascinates you about these technological innovations? When Martine Jarlgaard London did the world’s first Mixed Reality fashion show at London Fashion Week last year, the idea was to create an alternative to the conventional fashion show. By having pre-recorded the collection on models before London Fashion Week, visitors experienced them as life-size, 3D holograms, encouraging curiosity, exploration and actively engaging in the experience rather than passively sitting looking at models passing by. Do you believe that fashion shows have become outdated? I think that in the future, brands will connect directly with consumers, independent of time and space, and fashion weeks, as sales platforms will have become obsolete. However, the mystery and novelty surrounding them are nonetheless intriguing, and customers will continue to gravitate towards this sensation. But as an alternative, future realities such as Virtual Reality, Augmented and Mixed Reality will create sophisticated, personalised and mind-blowing experiences. This will alter the definition of, and demand for, fashion shows. Is it viable for an emerging label to follow the calendar of the industry or are there preferable alternatives? Martine Jarlgaard London is not presenting collections in the traditional, seasonal, sense, as what matters to me, is creating futuristic, innovative and thought-provoking projects, rather than being a slave to a system, which I don’t believe in. I love to refer to Alaïa as someone truly admirable as he presents collections in his own time. I’d love to see an adaptation of this approach, across the industry, as I believe we would see a stronger degree of creativity, independence, and diversity. Do you have any advice for emerging designers on how to educate themselves about working in a forward-thinking and conscious way? Rethink everything. Work with science, technology, and AI. Why do you think we haven’t seen a real breakthrough of sustainability in fashion yet? How could you envision it to succeed? Sustainability is challenging as it is complicated, and difficult to implement. For most companies it is not a priority, as it is too expensive and time-consuming. The breakthrough will happen once sustainability has become a business advantage. Incentivising sustainability in businesses would help accelerate this process. Where do you see Martine Jarlgaard London in the future? Having become a bit of a hybrid working in the intersection of technology, business, sustainability, fashion and art, Martine Jarlgaard London will continue to mutate into the future, engaging in more collaborations and keep pushing for visionary thinking, creativity, and positive change. Thank you, Martine, for your fascinating insights! The Martine Jarlgaard London Pre-SS18 collection is now available at the LISSOME/Store.